At Peach Brandy Cottage, our goal is very simple. We will give you one beautiful and stress free event. Our 6 acre site in the heart of downtown Dawsonville features a romantic Gazebo beside our lake, a stone Amphitheater built into the hill, Historic House with a Rocking Chair front porch, romantic gardens, and a HUGE Banquet Room overlooking the main garden, fountain, and lake. We offer free on site parking. Begin your life together at one of the best loved and most historic places in North GA. Find out why we were voted THE BEST PLACE FOR A WEDDING! Don't forget to join Peach Brandy Cottage on Facebook. We have several wedding photo albums. Our gazebo overlooks a private lake; our 3 tier amphitheater seats 300. Our 2100 s/f ballroom, set here for 100 guests, has a huge hardwood dance floor. You may invite up to 300 guests. 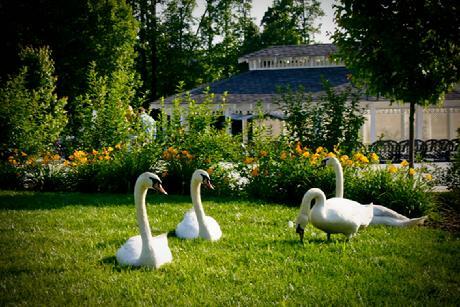 Our Swans will be here to celebrate with you. 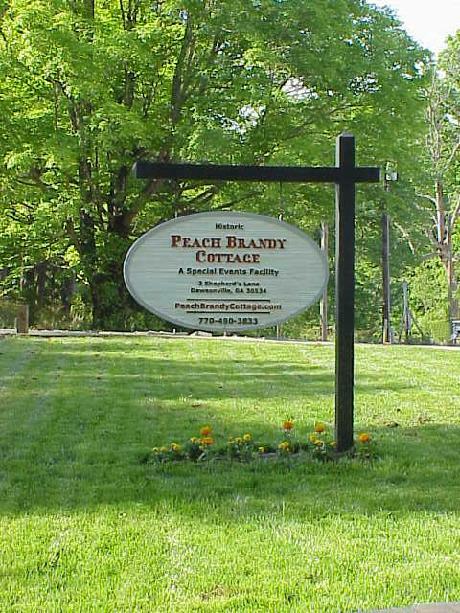 There is no better place to party than Peach Brandy Cottage. There are no noise restrictions for our ballroom. We only have ONE wedding at a time, so you will be the ONLY bride. Any coins collected in our Lucky Fountain are donated to Children International, which provides food, medical care and an education for impoverished 3rd world children.